Description: An eastbound Z train takes the low route. Description: Leading a 22 well and spine (If I remember right 9 wells) Q train this might also be a transfer run. Description: Southbound earthworm grain train rolls Past Tower 55. 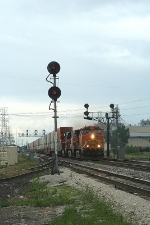 Title: BNSF C44-9W 5524 storms ahead with an eastbound. Description: A northobund manifests makes its way northbound as it skirts the mesas just north of Larkspur. Description: Q381 continues the Foreign Power-Palooza of sorts. Description: Believe this is the first DASH-9 I've seen with the new logo.